From ancient times to the present, artists have sought to explore humanity through portraiture. Masterpieces like da Vinci’s ubiquitous Mona Lisa, Sargent’s controversial Madam X, and Warhol’s multiple Marilyns are just a few examples of portraits that have weathered the ages and whose stories are still analyzed today. Mother-daughter duo, Maria Balingit and Ananda Balingit-LeFils, also have a fascination with portraits and the stories they tell. Through their own unique perspectives, they each seek to capture physical features and reveal the essence of their models through a variety of mediums. Local painter, Ananda Balingit-LeFils depicts archetypal characters and abstract themes through the subjects of family and friends. She is interested in the static nature and artifice inherent in the posed portrait. 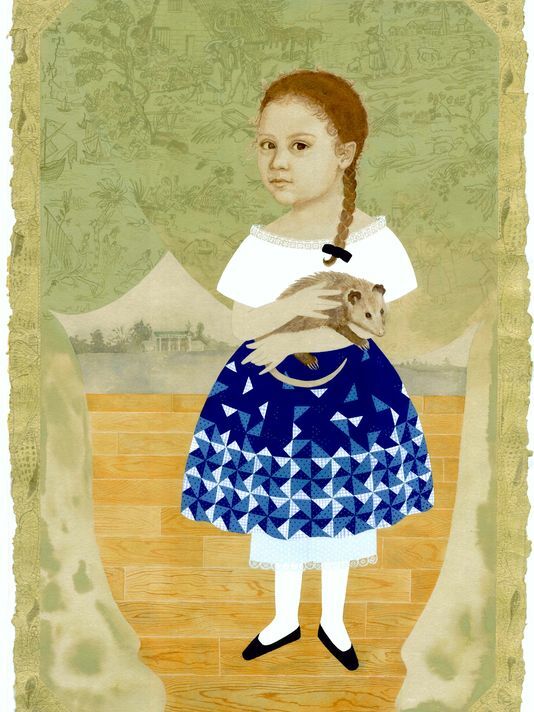 By referencing early American folk paintings, she depicts the awkwardness those works exemplify. Both fabricated and factual, character traits are revealed throughclothing, patterns and props. Each item suggests a particular time period, however, elements from disparate eras are intentionally included so that the nostalgia is nonspecific. A life-long artist, Maria Balingit recently began participating in weekly figure and portrait drawing groups at the Tallahassee Senior Center art studio. These sessions allow her to work with subjects who are typically older and, because the sitters hold a relaxed pose, much is revealed through body language, facial expressions and clothing. Though portraiture traditionally celebrates famous or important people, many of the sitters Balingit depicts are less-privileged individuals and are closer to the fringes of society. On display in this exhibition are 25 portraits that reveal elements of identity, individuality, personality, and connectedness. For centuries, portraits have helped us to better understand each other and our similarities as well as our differences. Like a mirror, a portrait echoes not only the nature of the sitter, but also the personality of the artist, and the spirit of the viewer. In this way, portraits are, literally and figuratively, reflections of ourselves. A free public reception is scheduled for Friday, July 25 from 6 – 7:30 p.m. Guests are asked to park in long-term parking and present parking tickets at the gallery for complimentary validation. This exhibition is presented by the Council on Culture & Arts as part of the Art in Public Places program sponsored by the City of Tallahassee. The gallery itself is located in the Tallahassee Regional Airport, 3300 Capital Circle SW, and is open daily from 8 a.m. until 11:30 p.m.
For more information about this exciting exhibition, upcoming exhibitions or the Art in Public Places program, contact Amanda Karioth Thompson at 224-2500 oramanda@cocanet.org. For a schedule of other exhibitions and arts and culture programs throughout north Florida, visit www.MoreThanYouThought.com. Learn more about COCA and sign up to receive COCA’s weekly email blast at www.cocanet.org.